Mukhtar al-Bakri is to be sentenced the day before the second anniversary of 9/11. BUFFALO, New York (CNN) -- The sixth and final member of an alleged al Qaeda sleeper cell pleaded guilty Monday to providing material support to the terrorist group al Qaeda. 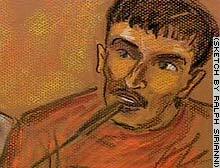 Like his five co-defendants, Mukhtar al-Bakri, 23, admitted to attending the now-destroyed Al Farooq terrorist training camp in Afghanistan in the summer of 2001. And like the other members of the so-called "Buffalo Six," al-Bakri acknowledged he had known in advance where he was going and that, once he arrived, he heard Osama bin Laden speak and met privately with the al Qaeda leader. Al-Bakri said that, speaking in Arabic, he told bin Laden that his parents didn't know he was attending the camp, and added that bin Laden told him to send a letter to them saying he was OK. Prosecutors made clear Monday that they do not believe terrorist involvement began or ended with the Buffalo Six. "There is more to this case than just the six men training at Al Farooq," Assistant U.S. Attorney William Hochul said. "There is a process now where we have to identify the recruiters, identify the financiers, the safehouse operators, and bring them to justice." Hochul's boss, U.S. Attorney Michael Battle, has said two unindicted co-conspirators who are believed to have directly aided the cell are still at large. But in addition to those two, Hochul said, prosecutors are seeking others in western New York State who were also intent on attending the Al Farooq camp. One of al-Bakri's co-defendants, Sahim Alwan, 30, stated in his plea that he knew of a second group from his city of Lackawanna, just outside Buffalo, that was considering traveling to the camp for jihad training. At 23, al-Bakri is the youngest of the six Yemeni-Americans. The other five men have already entered guilty pleas and face from seven to 10 years in prison. They are Sahim Alwan, 30; Faysal Galab, 25; Shafel Mosed, 24; Yahya Goba, 26; and Yasein Taher, 25. Al-Bakri, who appeared in court Monday wearing a maroon sweater with an American flag sewn on its front, faces 10 years in prison. Like the others, he is married, but al-Bakri has no children. Though he was one of the first alleged cell members to tell the FBI he went to the camp, he also told agents he did not consider himself to be a member of al Qaeda. "He went under a misapprehension of what was going to happen when he got there," said al-Bakri's defense attorney, John Molloy. "There was a brief talk, I think, about any kind of military activities, but mainly he was under the impression he would become a better Muslim." Al-Bakri and the other five men admitted to undergoing training and using a number of weapons, including assault rifles and rocket-propelled grenades. He also revealed that he and the others had undergone training in the use of plastic explosives, Molotov cocktails and land mines. Al-Bakri on Monday divulged another grim detail: A few months before the September 11 terrorist attacks, trainers at the camp stated that al Qaeda intended to attack America, and requested trainees to volunteer for suicide missions. The 19 hijackers on September 11 took over four U.S. passenger jets and crashed them into the twin towers of the World Trade Center, the Pentagon, and a field in Pennsylvania, killing more than 3,000 people. At a guest house en route to the camp, al-Bakri said, he saw a book written by bin Laden that contained maps of various U.S. installations in the Middle East. Prosecutors on Monday declined to specify what locations were described in the book. It has previously been revealed that the six men watched a movie at the guest house about the bombing of the USS Cole, which killed 17 U.S. sailors in a Yemeni port in October 2000. The men grew up and lived in the city of Lackawanna, outside Buffalo. Their families were among thousands of other Yemeni immigrants who moved there to work for Bethlehem Steel. Investigators found a .22-caliber handgun and a rifle with a telescopic lens in al-Bakri's last known residence, along with a cassette tape labeled "Call to Jihad" that allegedly containing anti-American sentiments. His defense attorney has said the rifle belonged to al-Bakri's father, and that the tape was 20 years old and refers to the Russian invasion of Afghanistan, which U.S.-backed soldiers opposed and fought. Al-Bakri's sentencing is scheduled for September 10. The other five men have sentencing dates scheduled throughout the summer. All six men have been in U.S. custody since last September. FBI Director Robert Mueller reiterated last month that he believed the Buffalo Six constituted a sleeper cell, waiting for orders to participate in some terrorist attack. Despite evidence of their involvement with al Qaeda, Mueller and others have said, they admit they have no evidence indicating all of the men were actively engaged in any terrorist plot. "Do I believe that these people had direct ties and relations with card-carrying members of al Qaeda?" asked Pete Ahearn, the special agent in charge of the FBI's Buffalo field office. "Yes, they did, and I think we've proven that."